I adore rice pudding. In fact, it is one of my favorite things to eat. My grandma from Greece, my ya-ya as I call her :), would bring Greek Pudding mixes with her when she came to visit the states. I had grown to LOVE the flavor it added to the pudding. However, we would find ourselves soon running out of these packets after she left. My mom created this recipe almost a decade ago and I think it is amazing. I still get excited when my grandma comes to visit and brings those Greek pudding mixes, but until then, this recipe definitely keeps my tummy happy. Growing up, I would often request rice pudding for my after school treat. I love that this version is skinnier than a lot of the others I have seen. It uses skim milk and is seriously delicious! 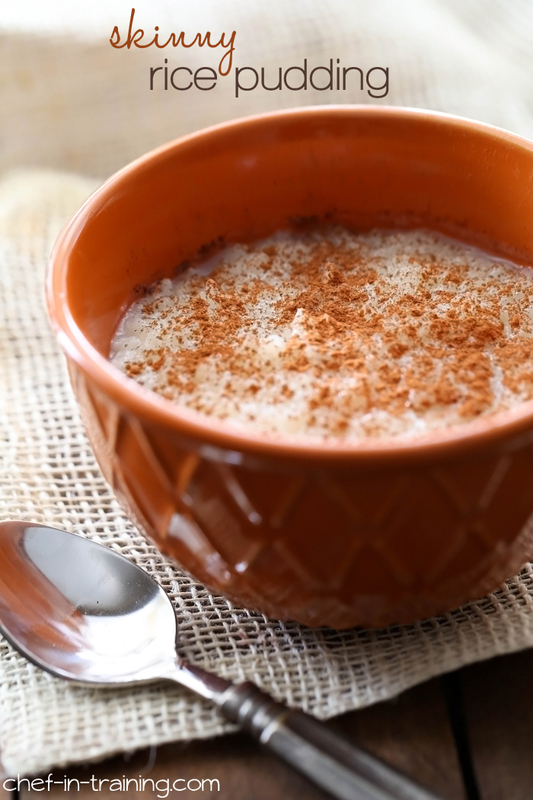 If you love rice pudding, give this version a try! This recipe is seriously amazing and a lot lighter than most recipes out there! Bring 8 cups of water and rice to a boil and reduce heat to a simmer and cook uncovered until rice is tender. Mix cornstarch and the 8 Tablespoons of water togeter and set aside. Add milk and sugar to rice and bring up to a boil again stirring constantly so milk does not scorch. Cook at a boil for 2 min and slowly add the cornstarch mixture. Cook for another 4 minutes until it thickens. Remove pot from heat and stir in salt and vanilla. Pour into a 9x13 pan or into individual bowls and sprinkle top with cinnamon. Do you use a specific type of rice when making this? It seems unlikely that all of the 8 cups of water would be absorbed when cooking the rice. The recipe does not say - are we supposed to drain any excess water from the rice after cooking? This looks so good! Gonna try this tonight to take care of my sweet tooth! My husband totally thanks you. He’s a rice pudding fanatic! And since I actually have access to these, would you be kind enough to share your yaya's version? I LOVE homemade rice pudding - definitely going to give this one a try! I haven't done it so I cannot say, but one reader told me they tried and almond milk blend and it worked great for her. Let me know if you try it out!